As much as we wish they would stay puppies forever, we cannot prevent our pups from aging. We can, though, take measures to allow them to live as happy as possible during their golden years. Outward signs of an aging dog that we tend to see include characterisitics such as gray hair and foggy eyes. However, there are many other internal concerns that come with age that we as owners may not immediately notice or we may attribute them to being a normal sign of senior dogs, rather than warning signs of something deeper. Noticing these common health concerns for aging dogs early may prolong their lives with you, and can allow them to age more comfortably. While arthritis and joint concerns are most common in larger breed senior dogs, it can affect dogs of any age. Just like humans, dogs are prone to arthritis as they become older. Most dogs are considered seniors around seven years old, depending on breed. Even being considered a “senior” your dog still has a lot of life to live! If your pet is struggling to jump onto the couch or bed or is having a hard time climbing stairs, this may be signs of degenerative joint issues. Since joint problems arise with age, there is no cure. However, you can ask your veterinarian if they would suggest a diet change, medication or supplement to support your pup’s joints. Nutrition and a balanced diet play a tremendous role in maintaining joint function with the vitamins and minerals in your dog’s food. According to the Animal Cancer Foundation, there are around six million cancer diagnoses in dogs every year. If you notice any abnormal bumps or lumps on your pup, don’t hesitate to talk to your vet about them. While older dogs tend to develop lumps with age, not all are cancerous and can be taken care of- it never hurts to check. Catching these diagnoses early is key! Especially as your dog reaches senior age, remember to take them in for regular screenings and check-ups. Here is some good news: “Pets today have a better chance of being successfully treated for neoplasia and cancer than they did before, thanks to advances in early recognition, diagnosis and treatment”, said by the AVMA. As expected with age, heart issues can develop and it is important to have any heart concerns checked and/or diagnosed by your vet to find the appropriate regimen. These could include medication, supplements or a new low sodium, cardiac-friendly diet. If you notice your dog has a rapid or irregular heartbeat (especially with low impact exercise), excessive coughing, difficulty breathing and more, talk to your vet about your dog’s heart to get them on the right track for a heart healthy life. Kidney failure is quite common in older dogs due to the natural aging process, which is why it is important to schedule consistent appointments with your vet to catch the disease early or keep up with regular treatment. It is not curable, but it can be managed with an appropriate diet consisting of lower protein and phosphorus levels, medication and supplements as prescribed by your veterinarian. Watch for signs of kidney concerns early on and let your vet know if you notice your pup is experiencing excessive thirst or urination. Years and years of tartar and plaque buildup can be a recipe for periodontal disease with a senior dog. The best way to manage teeth health is by daily brushing and routine dental cleanings with your vet. Why is dental health important in pets? Lack of brushing and care can result in bad breath, tooth decay and organ damage. Yes, damage to your senior’s organs can stem from tartar buildup, which can travel through the bloodstream and cause things like arthritis, heart disease and kidney concerns. Routine cleanings early in your pup’s life and throughout their life can help make sure their senior days are filled with a mouth full of healthy teeth to enjoy yummy treats and food for years to come! *We do require a prescription from your vet for any of our veterinary directed diets when there is a health concern present. 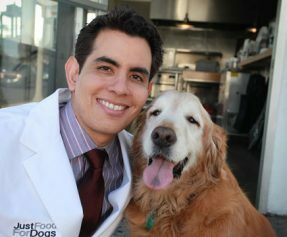 Please reach out to us at 949-722-3647if you or your veterinarian have any questions about a diet for your pet. If any of our suggested diets would not be suitable for your particular pup, consider having a custom formulation created!